Do you ever look closely at your plastics and wonder how they got to look so dull and green? Usually it is a sign that your gutters are blocked or not draining correctly during rain. 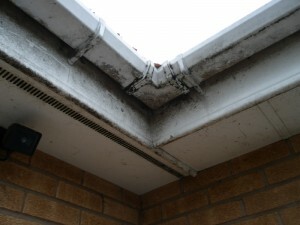 They overflow your gutters and down the facia’s causing them to turn black or green over time. DMC window cleaning can transform the way they look in no time at all using hot or cold pure water to clean them as the example photo’s show. Although there was some staining to the corner joint that had damaged the plastic finish, the customer was really pleased with the result on the whole property and is now having regular cleans to maintain the look.The gutters were badly filled with leaves and debris which was removed before the cleaning took place.The downpipes were all blocked with leaves and these too were removed, unblocked and re-fitted. 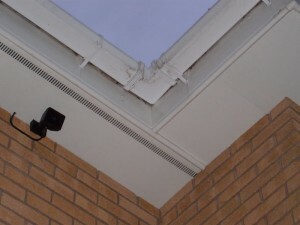 If you notice your property has similar problems with staining or mildew to the plastic’s whether it is the gutter system,window frames, facia’s, soffits or cladding then DMC window cleaning can clean them for you. If you would like to have a quote to transform your dirty plastic’s then please feel free to contact Duncan at DMC window cleaning in Droitwich,Worcestershire on the following numbers 01905 770854 or 07545 149197 for a free quote or demo.